The Dutch government announced to speed up the energy transition from natural gas to CO2 neutral resources in 2025. This high-impact decision hits all households and industries in the Netherlands, as over 90% of Dutch households are currently heated with gas, and most industries benefit from the cheap gas heating in their production environments. The Dutch Government has changed it energy policy drastically and formulated new policy in "the Energy Agreement" and "Energy report" all with sustainability and reduced CO2 emissions as targets. Climate neutral, CO2 reduction, Energy neutral are all popular terms in minimizing the impact of on the climate change. The Dutch government has an ambition to reduce its greenhouse gases to almost zero CO2 emission in 2030. Currently the Netherlands does not meet its CO2 requirements and has been penalized for it, leading to even higher urgency. Besides the required reduction in CO2 emissions a limitation in gas-production is also required to minimize the earthquakes caused in Groningen, the part of the Netherlands where the gas is produced. Most Dutch energy consumption arises from the generation of heat (44%). 75% of the heat generation in the Netherlands is done with natural gas, which means an income of 10 billion for the Dutch Government. The natural gas production from Dutch sources is declining rapidly and will be minimized in the future. The energy transition is a huge opportunity for Finnish tech companies who have knowledge about isolation, alternative heating systems, electric panel heating etc. Sustainability is not just a trend anymore since the Dutch Government committed to ending the dependency on natural gas, and corporates are taking it seriously in order to survive beyond their current gas consumption. Sustainability has become a positive business case. Environmental product and service offering are an important way to compete and earn money. 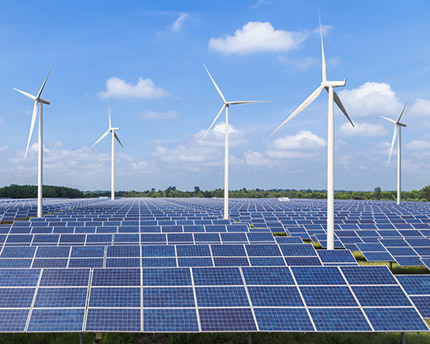 Energy transition from central to decentralized energy sources. Coal power plants will be closed or minimize their productions. Decentralized and renewable energy sources are being stimulated and explored: wind, solar, biomass, geothermal, tide, energy storage etc. After decades of voluntary sustainable policy, the Netherlands has fallen into one of the most serious polluters, and one of the least sustainable country of the European Union. The energy transition is triggered by protests of inhabitant of the province of Groningen, suffering from earthquakes in the region because of its gas production? Finnish companies, such as Nuuka Solutions and Solnet are successfully tapping into the Dutch market of energy solutions. To improve their position, the Dutch "Energy Agreement" strives for an ambitious 40% CO2 reduction in in 2030 and 80-95% CO2 reduction in 2050. Energy savings, renewable heat, biomass, clean electricity generation, capture and collection of CO2 (CCS) will play an important role in the energy transition. RVO has initiated "Energy Top sector" offering more than 130 million euros of funding for projects and research in the field of energy innovations annually. Finnish companies offering clean-tech technologies, like: geothermal, renewable heat, wind, solar but also isolating material will find a warm welcome in the Netherlands. TradeMill cooperates with Skip Red’s Marc Wullings, our expert on the Energy Solutions market. With experience in renewable industry, power storage and efficient building, we can support your entry into the Dutch market. We also know our way in the field of Dutch governmental support funding, grants and tax incentive for businesses in the Netherlands. Contact Petra Wullings for a chat about the Energy Solutions Industry in the Netherlands, we are more than happy to help you! Keep posted about the business opportunity news in The Netherlands and receive all updated Fact Sheets in your mailbox.